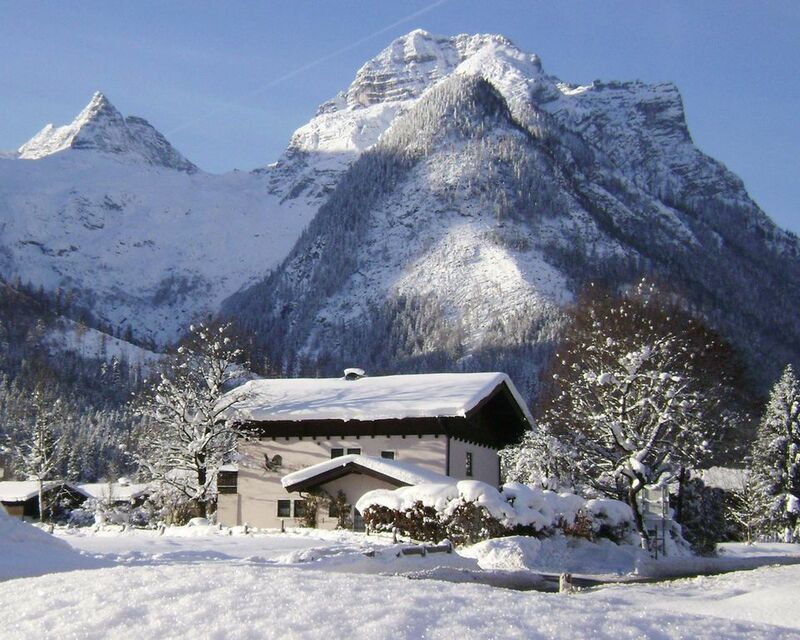 Hunters House in Lofer is a traditional Austrian family chalet owned by Ashley and Susan Keenes and can sleep up to 16 comfortably in its 8 bedrooms. The house is surrounded on 3 sides by open countryside. Only 5 minutes walk to the centre of the village, where you can gain access to the village cable car for winter skiing or summer walks. Located in the winter skiing and summer white water village of Lofer just 24 miles from Salzburg airport. None of the villages 15 restaurants are more than 10 minutes walk from the house. The village ski lift is just an 8 minute walk where you can ski on its 58km of pisted slopes in the winter; or catch a lift up to the beautiful mountain pastures to explore the scenic and waterfall strewn paths. The villages large landscaped outdoor pool is just a 3 minute walk from the house. 6 x bathrooms (3 are en-suite). 2 x separate WCs. Ground floor dining room with 16 seater table and sofa, kitchen with 8 seater dining table, living room with 2 sofas computer and freeview TV. Basement living room with sofa, 8 seater table and freeview TV. The well equipped kitchen has a double oven with ceramic hob, dishwasher, microwave, fridge and toaster. The towns 8 seater cable car is an 8 minute walk from the house. Lofer has 58km of piested runs and is perfect for beginners and intermediates. Within 30 minutes drive you can ski in Kitzbhuel, Waidring, Zell am See, and the all year round skiing on the Kitzsteinhorn Glacier in Kaprun. Even closer at Leogang you can gain access to the 200kms of skiing on the Saalbach-Hinterglemm skicircus. Equally as close is the 150km of skiing in the Hochkonig ski area and finally just beyond the 20 minute drive to Kitzbhuel you can find the 279 kms of continuous skiing on the Skiwelt. In short Lofer is the perfect base to enjoy local skiing or within a few minutes drive you can take a day out to ski in one of the many other local resorts. There are two 6000 metre 18 hole championship golf courses 30 minutes drive away in Zell am See. The 'Schmittenhöhe' and 'Kitzsteinhorn' courses, named from the local mountains of the region, make up the largest golf resort of the Austrian Alps. Just 10 minutes drive from the house is another 24 hole (1 x 18 hole and 1 x 6 hole) championship course at the lovely Gut Brandlhof complex. There is also an 18 hole 71 par course at nearby Maria Alm just a 30 minute drive from the house. Notes on accommodation: Our basement games room is equipped with a 7ft slate pool table, a 5ft Garlando table football game and a 6ft air hockey game. The basement living room is equipped with TV, British freeview and blueray dvd player. Due to BBC moving their satellite many programmes are now unavailable in Austria. Please bring your device & leads to plug into the house TV's to stream your favourite programmes. PLEASE NOTE You are required to recycle and dispose of all recyclable waste which you bring into the house i.e packaging, bottles, tins, newspapers etc. There is a depot in the village near the house which is open on Tuesday and Friday afternoons. There is a collection schedule of other non recyclable goods at the house. If your waste is not recycled we will arrange to move and store the waste and recycle it on the following Tuesday after your departure. The MINIMUM charge for this will be £50 and deducted from your depos Strictly no smoking in the house. Breach will result in loss of deposit!! Outside: The detached house sits in its own garden. The access to the patio is via french windows from the dining room or across the garden. Utility Room: A washing machine is located in the extensive basement area. Cleaning / Towels / Linen / Maid service: House towels and linen are included. The house is cleaned once a week on changeover day. Extra cleaning can be arranged at an additional charge. Other: Basement living room with British freeview TV, basement games room with 7 x 4ft slate pool table, a 5ft table football and a 6ft air hockey table. Ground floor living room with British freeview. Ground floor Boot room with a 20 pair boot dryer. The house was everything we dreamed of. Lofer is a beautiful village and very family friendly. Children upto 15 years have free ski passes if accompanied by their parents. We highly recommend the house and village. We will be back! Lovely location with mountains all around giving wonderful views. The property is spacious, clean and well kitted-out, with comfy beds, plenty of bathrooms and games rooms for everyone. We had a great family holiday - the pool and playground are delightful and close, as is the cable car. The village is attractive, spotless and quiet, though we were lucky to catch some evening festivities (helpful tourist info office opposite the cable car gives a sheet of local events). We liked the Cafe Dankl for food and friendly service. Would recommend the Salt Mines at Hallstatt and thermal baths at Berchtesgaden for wet days (both approx 45 mins drive) and Hellbrunn Wasserschloss for fun when it is sunny. The Lofer cable car ride leads to lovely opportunities for all generations to enjoy the mountain restaurants or go for spectacular walks on the Alm. Great place! A stunning house in delightful Lofer. We love this house (7 years already)! For a group of 13 people we need space, convenience, facilities, play and rest. This place offers to us (all ages) all of that. Close to the centre, close to the ski lift and offering super landscape views all around. Very well maintained at all times this house never disappoints. Also, the owner is more than happy to really useful local info which makes any planning so much easier. Salzburg airport is 35 minutes drive, Munich airport 1.45 minutes drive. Calais Eurotunnel is 11-12 hours drive. The house is centrally located in the village of Lofer. Zell am See is 30 minutes by car, Salzburg 35 minutes by car. Venice is 3.5 hours by car. Munich airport is 1.45hrs by car. In addition to the benefits of basing yourself in Lofer for your skiing holiday the Summer activities are numerous. As the roaring Saalach streams through the centre of Lofer canoeing, white water rafting and many other water related activities are available. The villages landscaped outdoor pool with its large sports pool, fun slide, non swimmers pool and the icy "stone mountain bath" is just 3 minutes walk from the house. The longest cave complex in Europe is minutes from the house as are the wonderful mountain pastures. Lofer has 13 restaurants and 3 good sized supermarkets all within a few minutes walk from the house. The house is strictly non smoking. Any breach of this rule will result in the loss of your damage deposit. Booking Notes: Security/booking deposit of £350 per week.This acts as your deposit for the booking and security against damage/breakages/excessive cleaning. The security deposit will be returned in full or after deducting the cost of repair/replacements/excessive cleaning. Balance payable 16 weeks before arrival. No refund after 20 weeks notice and full rental should still be paid. Heating in the summer, if required, will be charged at £30 per day (min 2 days). Additional tourist tax £1.50 per adult per day Changeover Day: Saturday is the preferred changeover day but other days might be possible. Please ensure you recycle your waste before leaving the house or a charge to do so on your behalf will be taken from your damage deposit (see notes on accommodation section). Notes on prices: Option to pay in Euros. There is a local tourist tax of £1.50 per person per day for anyone over 15 years. The tax will be added to the house rentalfee and paid on your behalf. As part of the tourist registration we will need your parties passport details prior to arrival. To enable the house to be cleaned for upcoming guests arrival time is after 4pm and departure before 10am. Minimum of 20 weeks cancellation notice or deposit will be lost! Summer heating, if required, £30 per day (min 2 days).